Heatherwick Studio designed the Learning Hub as part of the redevelopment project for Nanyang Technological University campus in Singapore, giving it a shape that represents a new way of learning based on sharing. 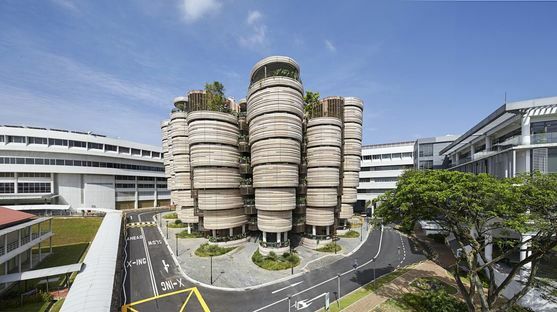 The purpose of the new Learning Hub, the study centre at Nanyang Technological University in Singapore designed by Heatherwick Studio, was to express in architecture the basic shift in education we are seeing today: from one person teaching many to many people teaching many. The low cost of information technology and universal availability of connection to the internet have promoted delocalisation of education, making the concept of ”participatory education”familiar to students. The social model of sharing information as a learning method inspires Heatherwick Studio’s layout of the Learning Hub. The eight levels on which the complex is built are arranged like petals, where the study rooms, which are not modular elements but are differentiated on the basis of a single shape, overlook a common foyer around the courtyard. The fact that there are no specific routes between classrooms formed by the addition of corridors (which not only limit the way people can move around but tend to physically separate spaces) permits freedom of choice in the way people explore and use each floor. The three-dimensional form of the petals making up the plants creates 12 towers budding out from a centre and opening up as they rise upwards, clearly drawing their inspiration from nature. The reinforced concrete of the structure is covered with ornamental panels in relief. Horizontal panels are created in the concrete with silicone moulds on the outdoor surfaces and decorative motifs on the inside. The creator of the drawings, London illustrator Sara Fanelli, says that in line with Heatherwick’s design, she wanted to draw “seeds of stories”, seeds of thought that anyone can make their own and develop to come up with their own unique, personal story. As Sara Fanelli explains: “These drawings, seeds, had to be several hundreds and layered, as some people would be coming back to the building over and over again through the years, and we wanted them still to be able to find new connections/discoveries”. Her 2D drawings were developed in 3D by Heatherwick Studio and printed in the concrete. The decision not to standardise the decoration is also reflected in the shape of the columns, with their wavy finishes and vertical arch shape, so that they are all different, like the towers. The image of imperfection characterising the complexity of the project is intended and designed to make human architecture come close to natural “architecture” such as that created by the erosion of water and wind or by limestone formations, or similar to animals’ dens. Vivien Leong of CPG Consultants says that one of the most important goals achieved by the project is mediation between Singapore’s strict building regulations, a policy of environmental compatibility and the original figurative design. The Learning Hub has been awarded Green Mark Platinum, the top level of energy certification awarded by the Building and Construction Authority (BCA) for solutions promoting natural ventilation without mechanical systems.